/ Events / Study Groups / DIJ Social Science Study Group / "The Slow Way Home: Civic Engagement and Walkability in Japanese Neighbourhoods"
All are welcome to attend, but prior registration ( heinrich@dijtokyo.org) is mandatory since seating is limited. Please register until 20 June. June 21, 2017	/ 6:30 P.M. - 8:00 P.M. The way children travel to school structures daily life for families around the world—but differs dramatically. In Japan, 98 percent of children walk to school every day, unaccompanied by a parent. In the United States, just 13 percent of children walk or bike to school, and most are driven to school by a parent. 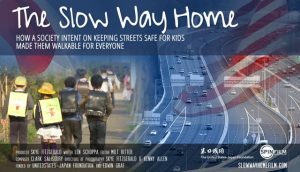 The documentary film “Slow Way Home” explores this divergence, examining how American families have largely given up on keeping streets and public spaces safe enough for children, while Japanese communities have mobilized to keep their streets safe and walkable, not only for children but for everyone in society. 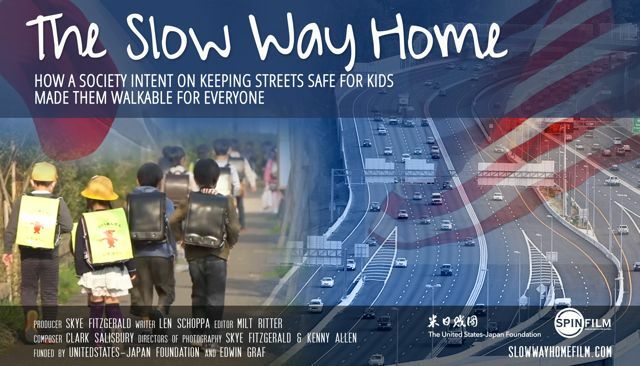 Following a screening of the film, Prof. Schoppa will offer remarks on the forces that keep parents and local residents in Japan civically engaged in working to preserve the safety of streets for local school children, when similar dynamics do not seem to operate in the United States. While the film and remarks will focus on the Japan-US contrast, we hope the discussion will stimulate comparisons with how kids travel to school in other parts of the world. Leonard Schoppa is Professor of Politics in the Department of Politics at the University of Virginia. He received his D.Phil in Politics from Oxford in 1989 and has been employed at the University of Virginia since 1990, with stints at Keio University (1993-1994) and the University of Tokyo (2000-2001) as a visiting researcher.